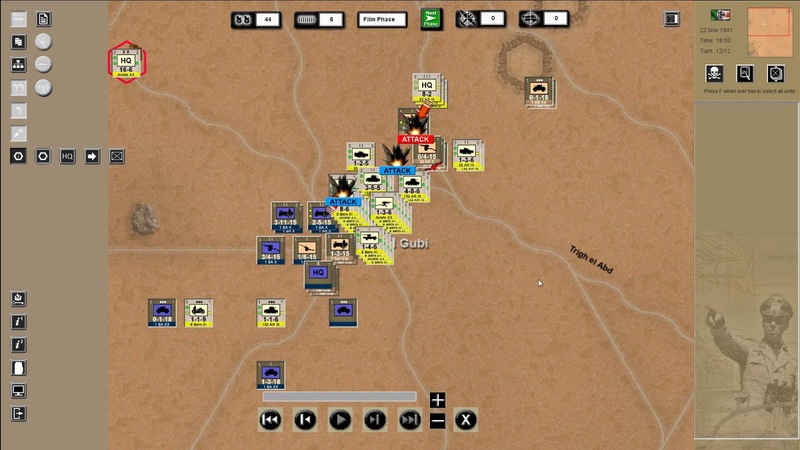 In my preview of the upcoming war game Desert War 1940-1942, I introduced you to its basic design and interface. The scenario itself is quite enjoyable and I felt like it deserved some closure. 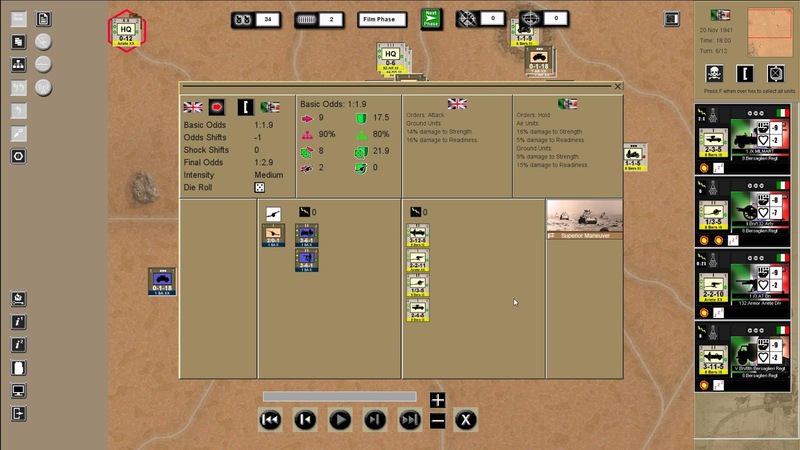 This blog post is the AAR of the battle from where I left it at the video. 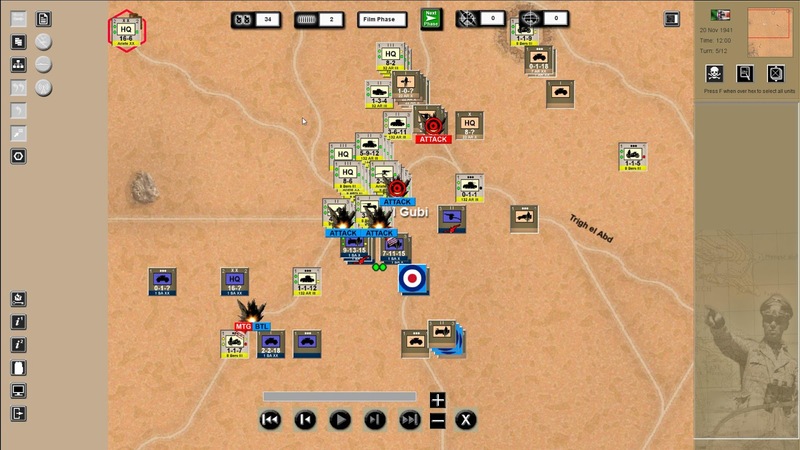 The enemy British division (computer opponent, brown counters) is apparently attacking from the south and the northeast. My battle plan for the rest of the scenario is sketched in the image above. Please note that the maneuver/tactical mission graphics are not included in the game. The center of the map is Bir el Gubi, which off course needs to be defended/retained. Southwest of Bir el Gubi, a couple of recce and armored units are to try a screen mission or just to warn us against any enemy attempt of double envelopment. The 32 Armored Regiment, despite its limited combat power, is to assume an offensive posture to disrupt the ENY's northwest axis of attack. The ENY tries its best south of Bir el Gubi. Their uninterrupted air support and our lack of success to counter them with our own air units is disconcerting. In the south west, our motorcycle platoon has met some unwanted engagements. 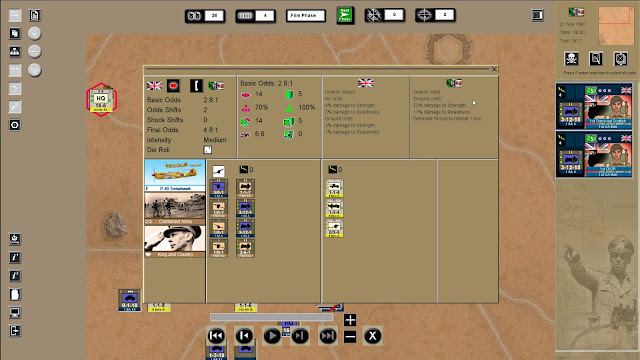 Players are strongly advised to watch their lines of command. 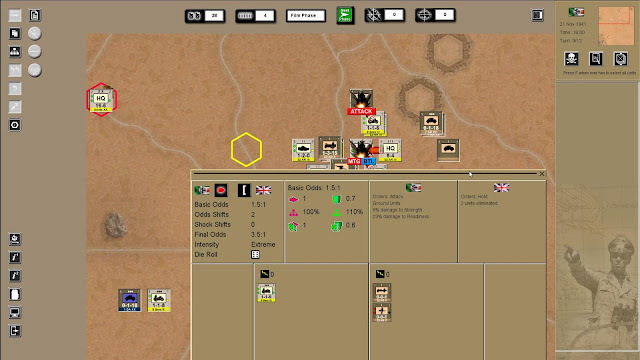 In this screenshot, the command radius of the 32 Armored Regiment is highlighted in green (full command) and yellow (extended command). I'm not sure if I shared a battle report screen with you. From this screen, you find out combat losses and all the assets available for that particular battle. 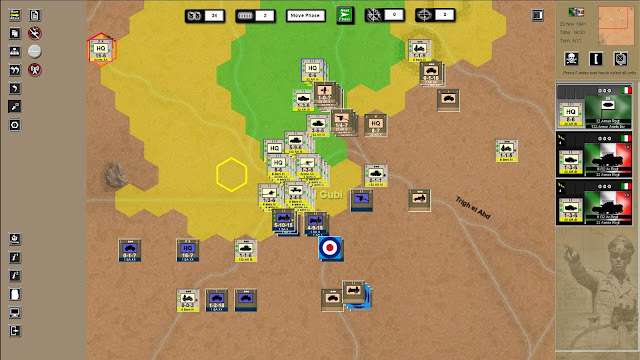 A desperate, multi unit attempt to cut off the British maneuver and support units from their HQ. This is pretty much the only successful counter-air mission that I can account for. This war game has an interesting computer opponent. You remember how I tried to cut off the British brigade in the north? Well, the British HQ unit just moved north, apparently to preserve its lines of command! Not so "ferrea mole" but certainly "ferreo cuore". This exploit by a motorcycle platoon deserves a mention. 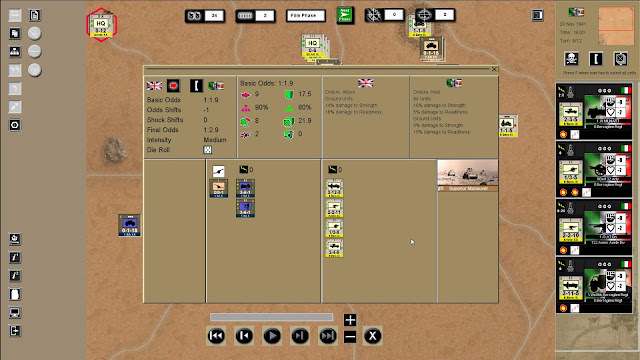 Note the sorry state of the British units involved. This is after our continuous artillery and air pounding. 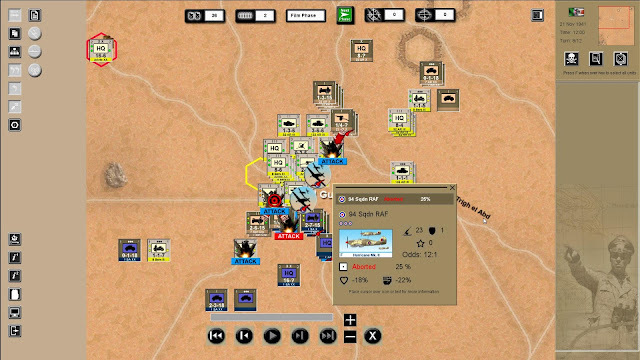 The battle reported in the overlay window is labeled "MTG BTL". 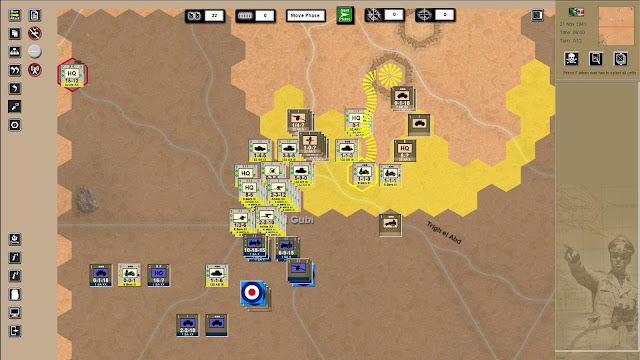 Some hours later, the British start to knock on the doors of our defensive positions. This is southwest of Bir el Gubi. Our massive losses and a subsequent retreat is disheartening. But the scenario ends. And we are victorious! 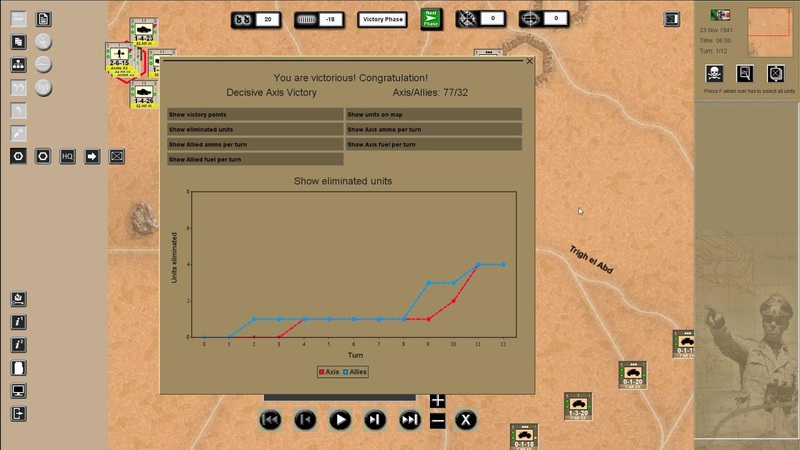 The debrief screens are very interesting and effective at showing the scenario's progression in terms of attrition, fuel and ammo consumption and victory points. You have read how entertaining and engaging the game is. Are you ready for its release of 22Mar18? I like the implemented limited command iteration. I'm just wondering if this would work on large scale like FITE2 in TOAOW 4. 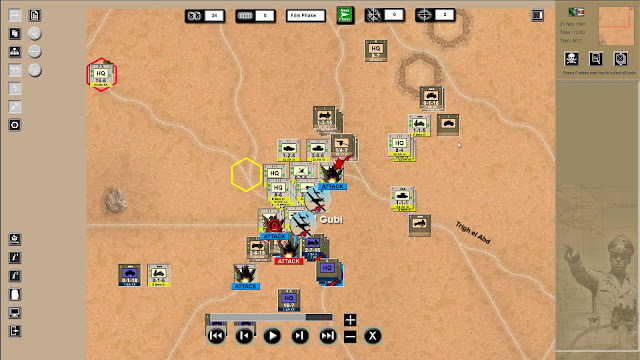 Also the AI seems goid but again it is the small scale combat (and darn short). Hi HMS and thanks for reading. I agree. This scenario is particular regarding stacking. Other scenarios fare better because the lower troop/units density. For stack browsing, there is a hotkey ("C") and that will help to ease some of the pain. Anon, given the scale of the units and the theater, the command aspect is easy to address by the player. I admire your dedication to play FITE2. That thing is huge! This is the same scenario covered in Avalon Hill’s old PC game “Operation Crusader”, and it looks like it plays out very similarly. That’s also a WEGO system and I highly recommend it (easy to find the game on abandonware sites - the Mac version is the best and runs great under Basilisk). Those Avalon Hill/Atomic games were wonderful, in particular Operation Crusader and Stalingrad. I think I'll get this game.